Get The Kindle Version of Zherosha Chronicles for Free April 21st! The mountain tribe is known for their red hair and large size. They are the closest to the city, and they act as a go-between for the other tribes and the Inersiens. At one time, the Natisiens had very little to do with the Inersiens except for trade, that is, until Naehus attacked the Natisiens for leaving the city. As part as a way to prevent a similar disaster from happening again, Inersiens and the Mountain tribe came up with the Protectorate. Someone who would care and protect a high-level Inersien, but also act as the fail-safe if the Inersien decided to become destructive. Forest Natisiens are smaller and could pass for a large human. Both women and men either keep their hair short or shave it all together to prevent getting tangled in the trees. 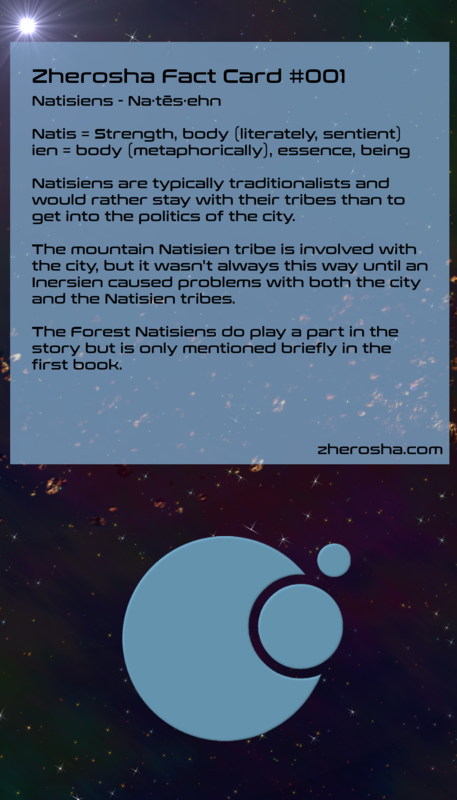 The Forest tribes and the Mountain tribes get along for the most part, but the forest Natisiens have short tempers. Even spouses would get into fist-fights. The current tribal leaders of the Mountain tribe and the Forest tribe are friends - or at least they get along. Nahaeda has a way of de-escalating a situation with other Natisiens. Feel free to download the above image to add it to your collection of pictures. If you upload this to your own website, you must link back. Nancie Neal was born in New Britain Connecticut in 1977. The oldest of four siblings (And later five through adoption), she grew up in the North East of the United States. Currently, she lives with her husband and six kids in Texas.